keeping alive the traditions of the bush. Uranquinty was the first home for many arriving in Australia from Europe after the second world war. 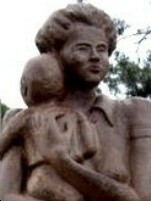 The families were housed in the buildings of the former RAAF training base at Quinty.This statue erected by efforts from the townsfolk reflects the spiritual nature of 'Quinty' a special place to the first peoples, the Wiradjuri Aboriginal Nation, a shelter for the dispossessed by war, home of a special folk gathering every October Long Weekend. The very name Uranquinty is a derivative of an aboriginal word that means, place of yellow box trees; place of rain; place of shelter. The names of Gundagai, Wagga Wagga, and Narrandera evoke visions of old Australia, the one that emerged from the eviction of black owners and the subsequent convict era to become prosperous centres of rural wealth. From the hills of Gudagai to the long green plains of the Riverina, huge sheep stations made fortunes for the squatters and bred legendary larrikin characters - shearers, bullock drivers and itinerant farm workers who worked bloody hard and played even harder. Their exploits became larger than life and national icons. 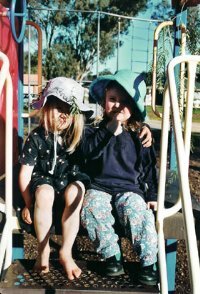 While Australian urban society may have viewed most of the characters of the bush with some disdain, there was a certain amount of envy of the swaggies freedom to roam the land and their ability to live a full life without the constraints, which are the foundation of city life. There was ‘Bluey Brink’ who was such a notorious drinker that legend has it he drank sulphuric acid by mistake and came back for more “it set me to coughing and you know I’m no liar, every damn cough set me whiskers on fire!”. Then there is the dog sitting on and shitting in the tucker box at Gundagai. No doubt that story of hardship and perversity was well received amongst the blokes ‘knocking down’ their pay cheques at Lazy Harry’s on the road to Gundagai; the Bulleting magazine, Henry Lawson and Banjo Patterson making the exploits tall and true essential mythology for what defined being Australian. There are the unsung heroes too; the women who often endured more hardship and deprivation than the menfolk, but because of the age were not publicly recognised in a man’s world. They were tethered to bush humpys, living in abject poverty, often completely alone for weeks on end with babies thriving or dying, alone. They weren’t in the pubs when the songs were being written and heroes saluted. The second -world war, the demise of the wool market, the acquisition of pastoral leases by companies and corporations, bigger and better machines, the ‘redevelopment’ of shanty and shack. All that was left of the old bush could be heard in the leaves of a pepper corn tree in the now silent main street of a bush town, which once boasted 6 pubs, and haberdashery outfitters to make a stockman look like a Pox Doctor’s Clerk. By the nineteen seventies the world of Bluey and the others had well and truly passed, yet there were resonances of it left in the experiences of a generation of baby boomers who had witnessed it’s passing in the fifties or been brought up to revere the myths. With Australia moving into uncharted waters of economic and cultural change, our identity needed something to fasten to and what better than an age of golden myth? In 1970 the first Wagga Wagga Folk Festival is held at Downside, juts out of Wagga Wagga. 1974- and at the instigation of a local musician named Ted Simpson, a few people gathered at the small town of Uranquinty, a short distance from Wagga Wagga, their purpose to celebrate Australian Bush culture. In the best traditions of the bush, amenities were scarce; there was an oval to camp on and Jacks Hut. Jack the old ex shearers cook lived in the tiny two-room hut on the edge of the oval. Jack, now deceased was a skinny, wiry little man who looked as if he never ate much of the fare he cooked up. He survived on longnecks of stout, for my health, he said, but warmly welcomed the arriving folkies with a big pot of stew. Some slept on the floor of the hut and in the morning, Jack put some wood into the primitive burner behind the football change rooms to provide hot water for showering, which had been in continuous use until sadly demolished in to make way for the new hall in 2008. Who could forget it, a draughty old almost derelict tin and concrete block shed with a broken concrete floor and a bit of black plastic to separate the ladies from the gents, taps so hot that they burned your hands or your bum, water at 99 degrees or stone cold because nobody remembered to stoke the fire, it took 5 minutes to adjust and when you got it right someone else would turn on a tap and you would get scalded or frozen, prepubescent boys hiding up in the umpire's box perving on the ladies in the shower (probably permanently traumatised) as most were old enough to be their grannies. Over the coming years there were many more festivals at Uranquinty, come rain, hail and occasionally, shine. The characters who have left their mark are many. To mention some will mean others are not, but I must be true to my impressions of attending a good many of those festivals. The late Ted Simpson and his wife Natalie, (deceased) were the inspiration of Uranquinty, or ‘Quinty’ as the regulars call it. The Publican Jan Wright (also deceased) and husband Bob donated the chorus cup and provided a free keg of beer to farewell the folkies. Other organisers who stand out over the years are Bev and Bill, Brenda and Dave and more recently, Tracey Harris, Davy Upton and Peter O'Dea. The history of Quinty is laced with characters from the original health food consumer, Jack, to others like Doug and Maggie, Dave Alexander, (deceased), the Shanty Crew – The Roaring Forties, father Michael O’Leary, Lyn Hudson, Edno, Allan Phillips, Alfie ‘yawning man’ Charlton, John Dengate, Big Barbara, Snappy Tom, Terry Gleeson and others too numerous to mention. 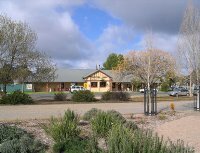 Uranquinty still has the features of a bush experience, log fires, shared meals, craic, camaraderie and a sense of belonging to something very special where you meet up with old friends and make new one. Most importantly, it has the support of some very fine musicians who understand the importance of maintaining a vibrant people's culture.